Check out Louise Ann Ford’s testimonial about her Magnum 27′ Sport! Here are a few shots of my 1969 27’ Magnum. She was built by Don Aronow to go along with a Magnum 35 that my father George Ford had built for himself in 1967 or 1968. They were both the same matching blue. Unfortunately, Dad sold the 35’ in 1974, but I have managed to keep this little gem. In 1969, when my father bought our 27’, he suggested to his good friend John Mitchell, then Nixon’s Attorney General, that the Coast Guard should get Magnums for the Key Biscayne house. Dad told me that they had sent a few out to San Clemente as well at the same time. Unfortunately, Dad died six years ago, but he would be 104 this spring so I guess he had a good run. 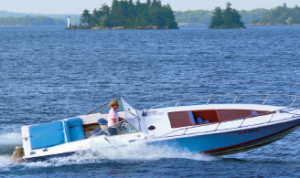 I still love my 27’ and she is used as our “sea” boat all summer long at our house in the Thousand Islands in the St. Lawrence River, where we have to travel 11 miles by our own boat through open rough water just to buy groceries!! I have decided that there is no way I could sell her. I thought I might be able to but I am just too emotionally attached to her. She has been my boat since 1978 when my father turned over our summer house on the St. Lawrence to me.